↑ Jha, M. (1997). "Hindu Kingdoms at contextual level". Anthropology of Ancient Hindu Kingdoms: A Study in Civilizational Perspective. New Delhi: M.D. Publications Pvt. Ltd. pp. 27–42. ↑ Mishra, V. (1979). Cultural Heritage of Mithila. 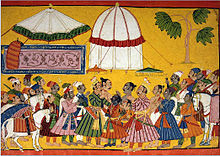 Allahabad: Mithila Prakasana. p. 13. สืบค้นเมื่อ 28 December 2016. ↑ Raychaudhuri 2006, p. 44. ↑ Raychaudhuri 2006, pp. 41–52. ↑ Michael Witzel (1989), Tracing the Vedic dialects in Dialectes dans les litteratures Indo-Aryennes ed. Caillat, Paris, 97–265. ↑ Vanita, Ruth (2009). "Full of God:Ashtavakra and ideas of Justice in Hindu Text". Religions of South Asia. 3 (2). สืบค้นเมื่อ 22 February 2017. ↑ Mukerjee, Radhakamal (1971). The song of the self supreme (Aṣṭāvakragītā): the classical text of Ātmādvaita by Aṣṭāvakra. Motilal Banarsidass Publ. ISBN 978-81-208-1367-0. หน้านี้แก้ไขล่าสุดเมื่อวันที่ 5 มิถุนายน 2561 เวลา 08:57 น.